Several thousand people have fled Rann, in northeast Nigeria's conflict-stricken Borno state, following a violent attack on the town on 14 January. People have started arriving by foot in Bodo, Cameroon - around 7 km from Rann - where Médecins Sans Frontières / Doctors Without Borders (MSF) has started providing humanitarian assistance. A team consisting of medical and logistical staff have been distributing food and water, and are providing emergency medical care. “Our team in Bodo estimates that some 8,000 people arrived yesterday and we expect several thousand more may come today. “We are preparing to assist 15,000 people with food, water and medical care over the coming days. In Rann, many parts of the town were burnt, including houses and shelters. The market and food stores were also destroyed. An MSF warehouse, office and pharmacy were also looted and burnt to the ground. Empty boxes of medical supplies were found lying scattered on the ground outside. MSF was able to evacuate one injured man on site, but most others fled to nearby Cameroon. “This is truly devastating for the people in Rann”, says Robert. “They suffer endless violence. And now they have to get back on their feet once more. How many more times is this possible? “The people of Borno continue to pay the price for this merciless conflict. All the warring parties must respect the safety of civilians”. “What struck me when we arrived was the silence. Usually, Rann bustles with life, but yesterday it was eerie and quiet, like a graveyard. The town has been devastated and I was devastated to see it. “Many parts of the town have been burnt. There was still smoke drifting in the sky and the fires were still burning in places. “All that’s left [of the MSF base] are piles of ashes. When I arrived, the tent where we store our equipment was still on fire. The buildings of other humanitarian organisations have also been looted and burnt. Bwala says for the people of Rann, there is now nothing left to stay for. “I saw a long line of people leaving for Cameroon – women, children and men, of all ages. Some had donkeys but many were just carrying their belongings. The ones I spoke to said they were leaving because they were too afraid to stay. “There is not much left for them to stay for anyway: their homes are gone and I don’t know what they would live on. The market was burnt and looted – food stores also. 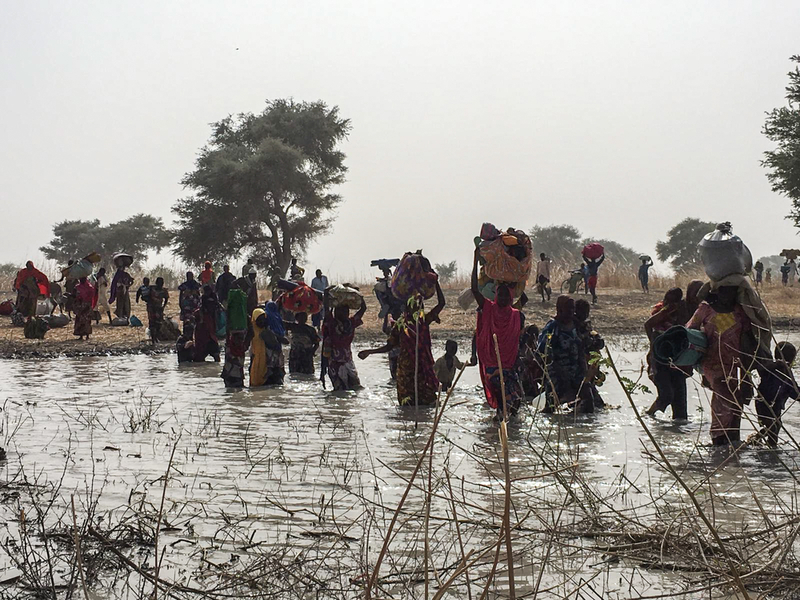 In northeast Nigeria, nine years of conflict between the military and non-state armed groups have taken a heavy toll on the population, with serious humanitarian consequences. Thousands of people have been killed. Others have been deprived of access to medical care and have died of easily treatable disease such as malnutrition and malaria. In the northeastern states of Borno, Adamawa and Yobe, 1.9 million people are internally displaced and 7.7 million people are in need of humanitarian assistance. More than 230,000 people have fled to the neighbouring countries of Niger, Chad and Cameroon.